Summer is in full swing here in Toronto, so why not spend a day surrounded by tranquil beautiful gardens? In this post we look at the top 5 gardens you can visit this season in Toronto, giving you details about their location, hours, and more. Toronto Botanical Gardens – with 17 award-winning gardens spread across four acres and daily activities on throughout the summer, there is plenty to see and do at the Toronto Botanical Gardens. Located at 777 Lawrence Ave. East near Leslie in Edwards Gardens, the facilities are easy to access by car or TTC. The family-friendly gardens have a number of upcoming events in the next few weeks, check out their calendar for more details. High Park – is a popular natural gem in Toronto, found between Bloor and the Gardiner Expressway, it has beautiful sites year-round. In the spring, sakura cherry trees bloom around Hillside Gardens in High Park – there’s actually an entire website dedicated to them! In the summer there is a mix of wonderful vegetation, waterfalls, bridges, and forest paths for you to enjoy. It’s also a dog-owner’s paradise, there are many off-leash areas for dogs, where your canines can run around. Did we mention that there is also a zoo in High Park? You can see wildlife like deer, bison, llamas, and peacocks. Learn more about what this great park has to offer. Toronto Music Gardens – If you’re downtown Toronto and you’re looking for an inspired, tranquil garden to visit – look no further! Toronto Music Gardens was deigned by Cellist Yo-Yo Ma and landscape designer Julie Moir Messervy, and inspired by Bach’s Suite No. 1 in G Major for unaccompanied cello, BWV 1007. It’s located at the harbourfront, right near the water. In the summer there is a concert series, currently in its 15th season, the concerts run most Thursdays and Saturdays throughout the summer. Allan Gardens Conservatory – a beautiful, historic landmark in downtown Toronto. Built in 1910, it looks like a giant greenhouse and is open every day of the year from 10:00am-5:00pm. It has a permanent collection of exotic plants, in addition to changing seasonal flowers. Currently the summer show is on and it features coleus, geraniums, caladiums, cannas, and impatiens. If you’re visiting during a different season, learn more about the flower shows here. Toronto Islands Garden – another excellent escape from the hustle and bustle of the city are the beloved Toronto Islands. 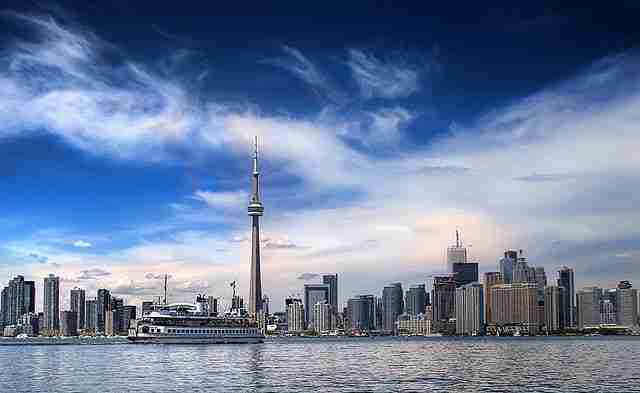 There are plenty of things to do at the gardens, the view in itself is worth a ferry ride, many would argue that it’s the best skyline view of Toronto you can find. There are beautiful trees, plants, and flowers to be found year-round. But there is a garden on the island too, the Franklin Children’s Garden, it’s an interactive garden filled with fun for the whole family. Have we missed any of your favourite gardens? Let us know in the comments section or tweet at us @adenearthworks. Enjoy the summer and even if you don’t get a chance to visit a formal garden or do a little gardening of your own, look around at all the beautiful flowers and vegetation around you! And if your garden or yard needs a little love and care, don’t hesitate to contact us.